The program, formerly known as HBX, allows both non-Harvard and Harvard students to earn credentials and certificates from the Business School. 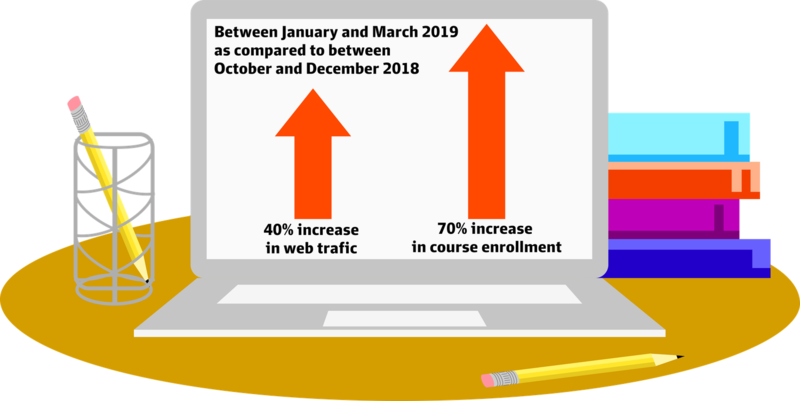 Web traffic and enrollment in the courses increased by 40 and 70 percent respectively in January through March 2019 as compared to October through December 2018. In fiscal year 2017, the most recent year from which annual data is available, the program had more than 8,000 participants. The school debated changing its name for almost a year before ultimately deciding to rebrand in January to allow more people to reach its online program. The program has already seen about 40,000 people complete a course since its inception in 2014.
Business School administrators also felt at the time that the HBX program had proven itself to be a worthy part of the larger Harvard Business School apparatus — another source of motivation for the rebranding, according to Nohria. Simeen Ali, managing director of marketing and product management at the Business School, said other factors, including changes in HBS Online’s marketing strategy, could also contribute to the rise in enrollment and web traffic. Ali said program administrators expect to see demand for the online courses remain high in the aftermath of the rebranding. She added that HBS Online has the infrastructure necessary to keep up with the increased demand. “We hope to continue to see the gains throughout the year as well, and going forward, we feel like we've barely scratched the surface of people being aware that you can take these programs,” she said. Ali also said the increase in demand has been equally distributed among all of the online classes offered under the HBS Online umbrella. “I wouldn't say that there's anything in particular that spiked as a result, but the increase in traffic has really been distributed across all the courses,” she said. Nohria said he hopes this surge in interest in the programs will not lower the quality of the applicant pool. —Staff writer Sam E. Sharfstein can be reached at sam.sharfstein@thecrimson.com. Follow him on Twitter @SamSharfstein.